The BAR Bygge & Anlæg is the Health and Safety Council of the Building & Construction industry. It is composed of 10 employers’ associations, two leader organizations and eight unions, which comprise together around 150,000 employees in the construction field. The BAR Bygge & Anlæg identifies the specific health and safety issues in the construction industry and publishes industry guidelines through documents, fact sheets and training materials based on good practices exchange. The BAR Bygge & Anlæg is composed of 10 employers’ associations, two leader organizations and eight unions, which together comprise around 150,000 employees in the construction field. Among the Employers’ Associations, we count: Arbejdsgiverforeninger, Asfaltindustriens, Arbejdsgiverforening, Dansk Byggeri, Danske Malermestre, Dansk VVS, Dansk Industri, DS Håndværk & Industri, Elinstallatørernes Landsforening (ELFO), Slots- og Ejendomsstyrelsen, (De offentlige arbejdsgivere), Glarmesterlauget, Gulvbranchens Arbejdsgiverforening. Among the Unions, we count: Blik- og Rørarbejderforbundet, Dansk El-Forbund, Dansk Metal, Fag og arbejde, Forbundet Træ-Industri-Byg, HK, Malerforbundet, 3F. Observers: Danish Chairman Association, Managers and Executives. Furthermore, BAR works closely with: Bygherreforeningen i Danmark, Danske Arkitektvirksomheder, Foreningen af Rådgivende Ingeniører. Every worker of the construction industry, including part-timers. Training can either be voluntary or compulsory depending on type of training (E.g. : ‘safety when working on heights’ for scaffolders), most trainings however are elective. For the compulsory trainings, we offer short training programs on one day to more develop training programs of three weeks (i.e. : heavy scaffolds). The optional qualifying trainings, usually more dedicated to operations managers, involve one day to one-week period of training courses. The majority of the trainings are based on attendance, but some training is followed by a final written exam with multiple-choice tests, however this is rather an exception. For some training, the course participant receives certificate (e.g. safety training, tower crane training, etc.). All construction workers however, receive a certificate of attendance. 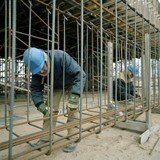 The labour market vocational training school finances 20% of the training schemes through the social partners. The government finances up to 80% the training schemes as well as substitutes to employers enrolling their employees within these training schemes. The BAR Bygge & Anlæg produces textbooks for various occupational training programs that are used in the Labour Market Vocational Training School. Employers and public finances finance these textbooks and tools.